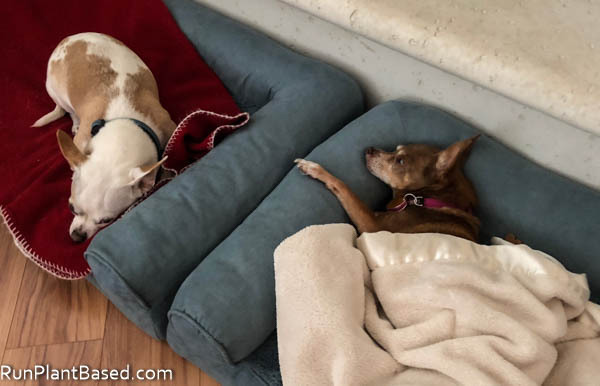 The pups seem to be loving their new beds spending a lot of time chilling in them this week. But poor Leela is getting a little slower and more disoriented not adapting to blindness well and mostly deaf now, but she still enjoys eating and sleeping. It’s hard watching them struggle as they get older. 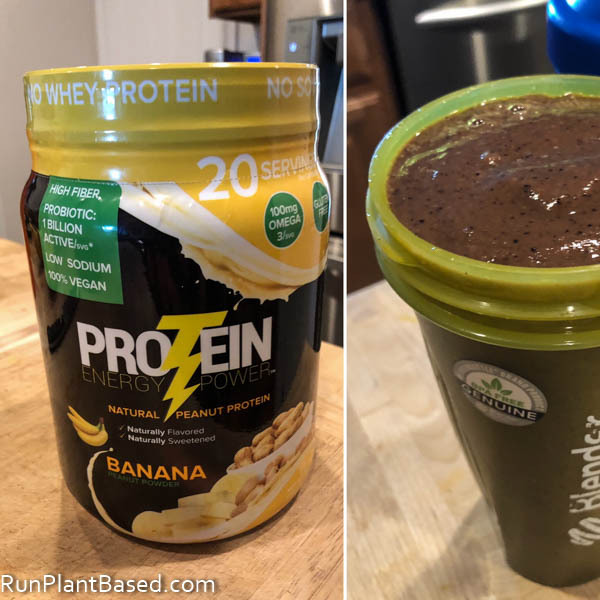 I have been trying to use more whole food protein powders in our smoothies sticking simple hemp protein lately which is fine, but can be tricky to work with and not exciting. So I splurged on a jug of Protein Energy Power Banana Peanut flavor powder at Grocery Outlet to mix things up a little. Never heard of this brand before, but curious on the flavor and liked the nutrients added. The flavor is really good with peanut buttery banana and not too sweet. It’s also a very fine powder, not earthy or gritty at all and blends smoothly fast. Not an option for those with a peanut allergy and not replacing hemp protein powder with it. But a fun option for smoothies or soft serve banana ice “cream”. 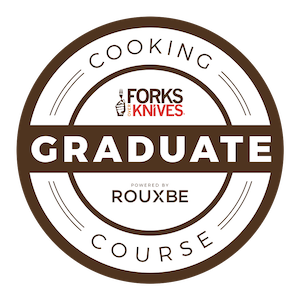 The remnants of a cold and/or allergies have been doing odd things to my appetite and I haven’t been too creative in the kitchen. One simple dish I am a fan of is simmering veggies and beans or tofu in the Whole Foods brand Organic Fat Free pasta sauce. Add in a little oregano, garlic, basil, and nutritional yeast for a simple one pot oil-free dinner. 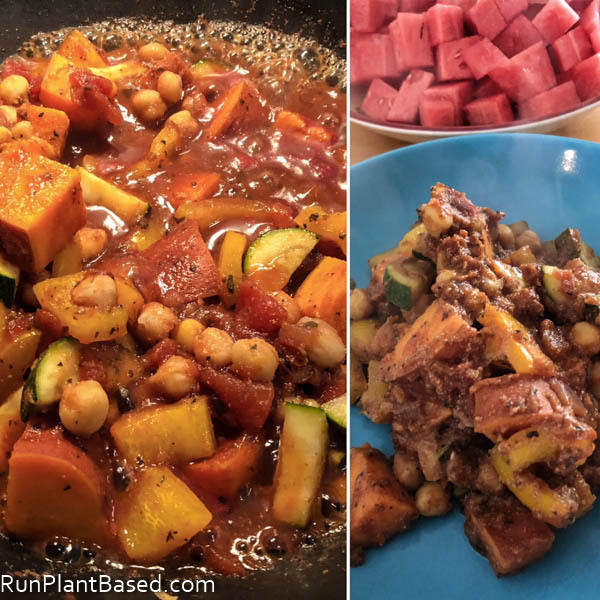 It went great with chopped sweet potato and chickpeas for this meal. 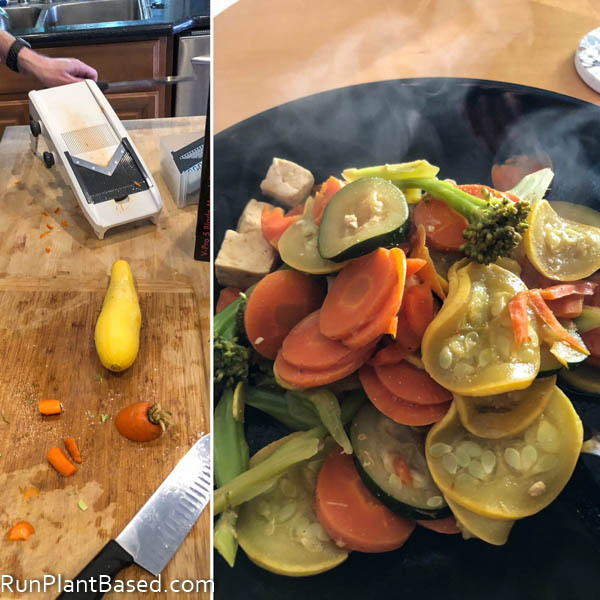 We recently replaced our mandolin slicer with this Mueller Austria 5-blade slicer and a summer squash and tofu stir fry was the perfect way to test it out. It worked great for the squash, a little trickier with thick carrot, but still fun. Looking forward to trying sweet potato fries with it next. 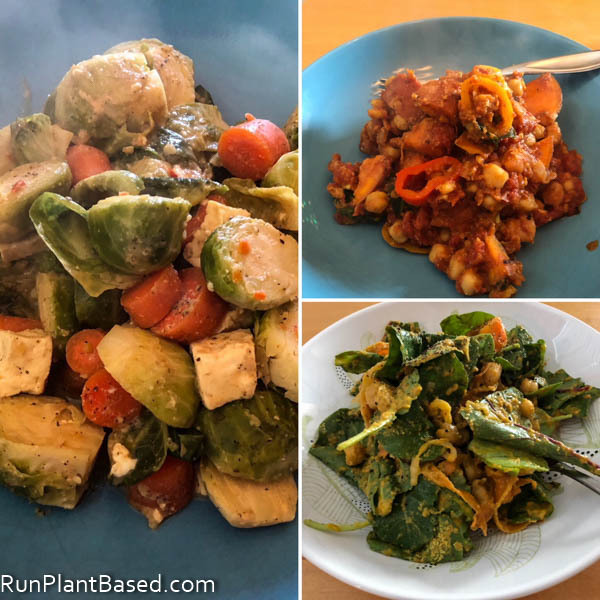 Other lazy eats included a brussels sprouts tofu stir fry, tomato curry sweet potato and chickpea saute, and power greens salad with blended avocado ginger dressing. Ah Wednesday, closer to Friday! Hope you’re having a healthy week! Haha, me too this week – much better than going to work! I love all of the colors in your dishes this week. Looks delicious!